QUESTION: Reading your posts it seems to me you disagree with the pending hyperinflation forecasts. What do you see coming then? What we will first see before ever reaching that point in the United States is the significant impact of STAGFLATION. Rising taxes increase the cost of doing business and cause prices to rise. However, they rise only because of rising costs and not demand. Therefore, you have rising prices defined as inflation, but without the economic growth or demand. Thus, what unfolds is called stagflation and this instigates civil unrest for the standard of living declines with the net disposable income. 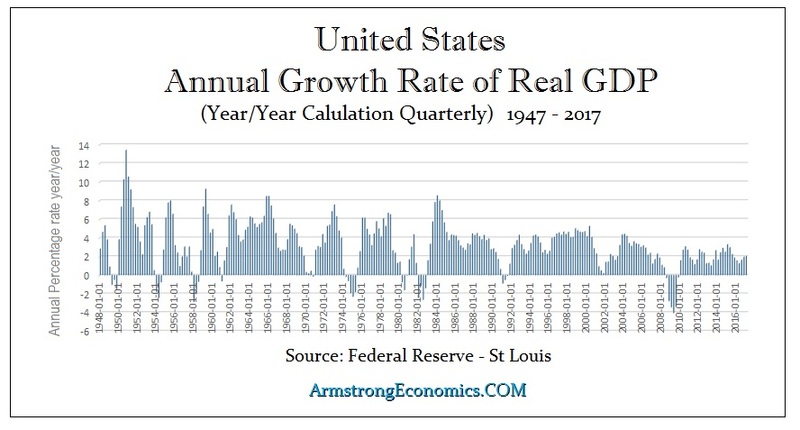 We are entering a period of STAGFLATION where economic growth has been declining. Central banks will be jumping for joy just to return to a 3% real GDP growth rate. Annual growth rates have been in a bear market since the 1950s. The bigger the government becomes, the more it must extract from the economy to sustain itself.